I was quite surprised in the mid-eighties when Mike Murray and Ray Cresswell came all the way down from Aberdeen to run in the British Milers Club races. To travel 150 miles each way to race for less that two minutes, at your own expense, speaks volumes for their determination. They were well worth their place in the races and they were highly respected by the other runners. Both are mentioned in this collection of profiles by Colin Youngson who knew all of the runners mentioned here well. “Most of Aberdeen Amateur Athletic Club’s best men have been profiled already (Alastair Wood, Steve Taylor, Mel Edwards, Bill Ewing, Fraser Clyne, Graham Laing, Colin Youngson, Rab Heron, Donald Ritchie, Peter Wilson and Jim Doig). Aberdeen enjoyed two peak periods: between 1961 – 74 (three silver medals in the E-G, four silver and two bronze medals in the Senior National). Then there was 1980 to 1989 (three gold medals and four bronze in the E-G, three bronze in the Senior National; two silver in the CC Relay and two bronze in the Six Stage Relay.) A real sign of future promise came in the 1976 Scottish Junior National Cross-Country when AAAC won team gold with Fraser Clyne, Graham Laing, Danny Buchan and Steve Cassells. However the Fast Pack for the Eighties must include Graham Milne, Mike Murray, Ian Matheson, Ross Arbuckle, Simon Axon, Chris Hall, Ray Cresswell and Dave Duguid. 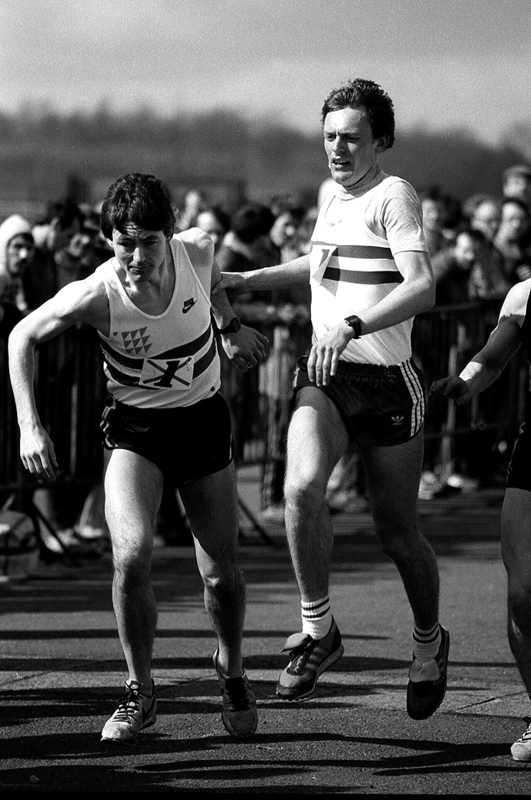 1983 was also the year that Graham Milne ran his fastest ever marathon (2:21:27). He too represented Scotland in that gruelling event. He proved his endurance further in two Jogles (1972 and 1982). His other personal bests included 14:32.5 (5000m), 30:54.4 (10000m) and 66:57 (half marathon). Graham went on to become a successful veteran runner winning Scottish championship medals in several age-groups. Mike Murray with his athletic loping stride, looked every inch a track specialist. Indeed in 1984 he set an Aberdeen AAC record for 800m (1:52.4) and also ran 1500m in 3:50.58. Mike was a member of the elite British Milers Club. However, partly because he trained a lot with that hard man, Peter Wilson, Mike also became an invaluable part of his club’s road running team, not only in the 1982 John o’Groats to Land’s End Relay, but also in the Edinburgh to Glasgow which he ran eleven times winning six medals. Although AAAC won bronze medals in the 1981 E-G, when Mike tackled Stage Three, his best efforts were all on Stage Seven. It had been obvious during the April 1982 Jogle that he was an excellent downhill runner, and the route on the penultimate stage allowed him a chance to demonstrate speed and flexibility. Mike could be relied upon to maintain a gap, gain places or extend a lead. Further bronze medals were gained in 1982, 1987 and 1989 but the finest achievements were in 1983 and 1986. In both cases Fraser Clyne completed the sixth leg, passed on to Mike Murray and made it possible for Colin Youngson to hold on to the lead. The result was two gold medals for the north-east club, both won in dramatic fashion. Mike also won two bronze medals in the Six Stage Relay (1981 and 1989). Then Metro Aberdeen broke away and Aberdeen AAC struggled in the E-G, although Captain Murray continued to do his best. Yet he trained harder for a while after he turned forty and, having joined Metro eventually, was part of the team which won silver medals in the 1999 Scottish Veteran Harriers Six-Stage Relay. Simon Axon was a Welsh Junior Cross-Country International who moved to Scotland and ran for Inverness Harriers before heading south to live and work in Aberdeen, and to join AAAC. He made his debut for North District in the 1984 E-G finishing fifth in a high quality Stage One. In 1985 he turned out for Aberdeen and was given the responsibility of tackling the long Sixth Stage. His new team finished sixth. However other key athletes had made their first appearance for Aberdeen in the race that day: Jim Doig and Ray Cresswell as well as Colin Farquharson. When Chris Hall joined too, the 1986 Aberdeen E-G outfit looked formidable. Simon moved up three places to fifth on the difficult second stage, only sixteen seconds behind the fastest time. This allowed Jim Doig to blister into the lead on Stage Three, and eventually Aberdeen AAC won by over a minute. In 1988, Aberdeen led from Stage Three onwards and Simon kept a healthy lead on Stage Seven which was just as well because the last leg runner had developed hamstring problems and only finished 21 seconds ahead. Still, that was a second gold medal for Simon Axon and he added a bronze in 1989 when he moved past ESH on the final leg. In 1988 Simon had finished twenty second in the National Crocc-Country when his team finished third. Simon Axon ran very well at longer distances too. He completed the 1986 London Marathon in 2:19:53. In 1987 he not only won the prestigious Inverness Half Marathon (65:44) in April, but also that June reduced his best time at Gateshead to an impressive 64:25. Over 10K, he won the Aberdeen 10K in 1989 and 1990. Although Ross Arbuckle has represented Cambuslang Harriers for much of his career, he started out with Aberdeen and in fact ran for Scotland in the 1980 World Junior Cross-Country. Previously he had shown outstanding talent on the track as an Under-17 Youth (800m in 1:56, 1500m in 4:01.1 and 3000m in 8:42). As a senior he improved to 1:53.5 and 3:55.8. Ross won the three senior team medals with AAAC: bronze in the 1981 E-G; silver in the 1981 Six-Stage Relay and bronze in the 1982 National Cross-Country. With Cambuslang, he went on to win team gold in the 1988 National (thirteenth finisher), a full set of medals in the Cross-Country Relay, including gold in 1987, and bronze in the Six-Stage Relay. To this day he continues to be a modest, popular but very successful veteran athlete. He won several team gold medals in the National Veterans Cross-Country, and frequently represented Scotland in the annual Masters Home Countries Cross-Country International. Ray Cresswell always had considerable talent and as a Junior ran 1500m in 3:58.4. His Senior bests include 1:54.24, 3:50.0 and 8:24.82. In the E-G, he was part of a winning team in 1986 and 1988 (when he was fastest on Stage Three, moving from third to first.) In addition he won bronze medals in the 1988 National (twentieth finisher) and the 1989 Six-Stage Relay. Ian Matheson was another brilliant young athlete who trained immensely hard. He was rumoured to be covering 100 miles per week at the age of 16! Ian won East District Cross-Country titles as a Senior Boy (1980) and a Youth (1982). Before the age of 20 he could run 5000m in 14:46, 10000m in 30:49 and the steeplechase in 9:30.7. He continues to hold the AAAC Senior club record for 5000m (14:18.9). However his real forte was as a hill runner, since he represented Scotland in the 1989 World Championships. In the National Cross-Country Ian won team bronze in 1988, and added another bronze in the 1989 Six Stage Road Relay. He also ran well in the E-G, helping Aberdeen towards victory in both 1983 and 1988. Chris Hall, an eccentric, flamboyant Welshman, joined Aberdeen in 1986. There was no doubt that when in the mood he was a classy performer. In the E-G, he won gold in 1986, bronze in 1987, gold in 1988 and bronze in 1989. Chris also won team bronze medals in the 1988 National (eleventh finisher) and the 1989 Six-Stage Relay. After he moved to Dundee and ran for the Hawks, he won another gold medal in the 1991 Cross-Country Relay. Chris was very successful in road races. For example, he won the Aberdeen 10K in 1991 and 1992 (29:57). His track bests included 14:20.58 and 30:26.26. In addition, Chris ran a half marathon in 65:02. Dave Duguid a stylish athlete, ran well as a Junior and went on to record Senior best times including 8:39 (3000m), 9:13.9 (3000m steeplechase), 31:04.8 (10000m) and 68:36 (half marathon). He won the Aberdeen 10K in 1988. In the E-G, he won bronze in 1987 (as did Rob Taylor and Gary Zeuner) and gold in 1988 when he kept the lead on Stage Four, as well as bronze in 1989 (with Rob contributing again).